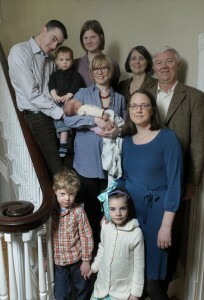 The Hutton Family Fund will engage multiple generations – including nine-day old Nicola –in community philanthropy. For John Hutton, establishing the Hutton Family Fund at Hamilton Community Foundation is a way to engage future generations of his family in giving back to the community. John and his wife Eileen, daughters Camille and Jane, and their son Ray and his wife Caroline are all involved in deciding the purposes of the newly-formed fund. The family is especially interested in Hamilton Community Foundation’s work with neighbourhood hubs. Both Ray and John are engineers with McNally Construction, a family business with a 60-year presence in the McQuesten neighbourhood. They appreciate the Foundation’s focus on neighbourhood vitality and its approach to defining neighbourhood needs. A portion of the Hutton fund’s grantmaking will also support the Community Fund to meet other community priorities. John points out that establishing the fund at HCF gives the family all the benefits of a private foundation, without the administrative headaches of setting one up. And to do it now, rather than through bequests, allows Eileen and John the pleasure of engaging in community philanthropy with their children today. But the long-term legacy is uppermost in all their minds. While the third generation of the Hutton family is still too young to participate in the fund, the opportunity will be there for them in the future. “Eileen and I like that the next generation can have some influence over the fund,” says John. “And the next generation and the next,” adds Ray.